“Humane meat is a lie, these animals did not want to die,” a group of animal rights activists chanted as they walked through the Brooklyn Whole Foods market on Saturday. After the animal rights group Direct Action Everywhere (DxE) released a video with footage they filmed at the Petaluma Farms in northern California—an egg supplier to the international organic food chain—the group has organized protests in over 50 cities around the world, including at Whole Foods markets across the United States. In the video released online two weeks ago, hens are seen piled on top of each other in crowded wired cages. Some have lost most of their feathers, others have abnormal growths on their bodies, or are covered in feces. The farm is designated as having met the Certified Humane standards, a certification program for humane treatment of farm animals, run by the nonprofit Humane Farm Animal Care. The organization is endorsed by the American Society for the Prevention of Cruelty to Animals (ASPCA), the Humane Society of the United States, and over 60 other animal rights, animal rescue, and food safety groups. But DxE points to the terrible conditions they filmed as evidence that the poultry industry has vague and loose standards for animal welfare. “It’s important to emphasize that the standard itself is meaningless and arbitrary,” said DxE co-founder Wayne Hsiung in a press statement. He cites a provision in Humane Farm Animal Care’s standards for emergency euthanasia of egg-laying hens, which allows “cervical dislocation” by “stretching the neck to sever the spinal cord and cause extensive damage to the major blood vessels,” according to their standard guidelines. “There is nothing humane about snapping an animal’s neck, and the fact that such brutality is deemed humane shows us the central problem: namely, that this industry is inherently violent,” said Hsiung. There is nothing humane about snapping an animal’s neck. 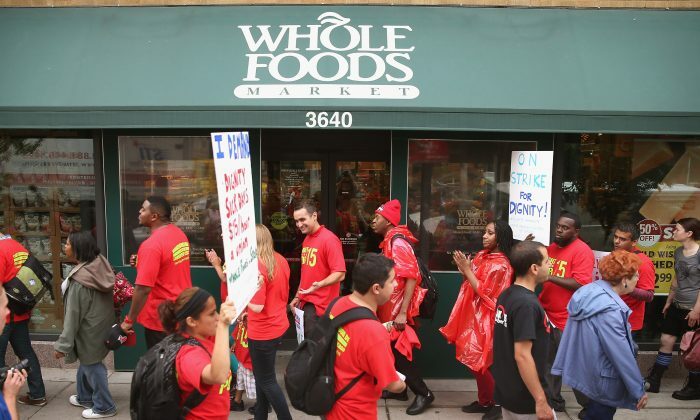 DxE also noted that one of Whole Foods CEO’s, John Mackey, is a board member of the animal advocacy group, Humane Society of the United States. “There is an incestuous relationship between major animal advocacy organizations and animal agriculture itself,” said DxE’s press coordinator Brian Burns in a statement. “By working together to sell tortured animals’ lives as ‘humane,’ Whole Foods and The Humane Society of the United States are committing moral fraud on the public,” he said. In a New York Times report, the owner of Petaluma Farms, Steve Mahrt said the video did not depict the whole of their operations. “They (DxE) had to go through 15 barns off and on over a year to find three chickens they could use to make their point in this video,” Mahrt told the Times. There are currently multiple certification programs for humane animal treatment in the country, which may have differing standards on how to handle the animals that are not transparent to the consumer. For example, Certified Humane requires a minimum of two square feet per adult bird to qualify as “free-range,” while the Animal Welfare Approved program requires that chickens after their brooding period get access to at least 4 square feet of space.